Throughout most of Europe, the testes that have been involuted during hibernation begin reactivating about midway through hibernation. Full spermatogenesis (sperm production) can be present from March or April and continue into August; sperm production has declined to a minimum by late September. In the UK, the main breeding season, sometimes called the rut, runs from about mid-May until September. Some populations, in France for example, exhibit clear spring and summer phases to the rut, while it appears to be a continual process in Britain. In New Zealand, hedgehogs breed from November to March or April. During his Ph.D. studies, Nigel Reeve observed courtship among hedgehogs inhabiting his London golf course study area to peak during August, which tallies with Pat Morris’ findings of a peak pregnancy rate in September – 52% females studied in England and Wales were pregnant during this time, compared to an average of 44% between May and July. In his Complete Hedgehog, Les Stocker notes that births may continue until early October, but most litters are born by July. Similarly, Pat Morris considered most young are probably born in June and July in his New Hedgehog Book. Courting hedgehogs in my garden in August 2015. Notice that the much larger male circles the smaller female (probably her first breeding season), trying to get his nose underneath her and climb on her back, but she's shunning his advances. This behaviour is accompanied by much "huffing". - Credit: Marc Baldwin. Courtship may be broken off and resume many times, continuing for several hours. Burton noted that the snuffling serves a definite function, with the sow being almost mesmerised by the tempo. This is a particularly interesting observation because although it is often thought that the snorting and grunting are a mutual exchange, they actually seem entirely the product of females hissing at the males; males apparently make very little noise during courtship. Snorts are emitted by the female every three seconds or so and each is accompanied by a jerk of the body. A protracted courtship may also help a female judge the vigour of potential suitors, with less tenacious individuals giving up more readily. In Ireland Amy Haigh and her colleagues documented 39 courtships between 16 individuals, none of which ended in successful copulation. The average bout of courtship lasted about an hour, although one observation went on for 2 hours and 20 minutes. Courtship always ended with the male seeming to lose interest and moving away to start foraging. Haigh and her co-workers also observed promiscuity among the hedgehogs – females were found with up to seven different males and males with up to three different females. Observations of matings are rare, but there are some genetic data suggesting that females will mate with several partners. A team from the Waterford Institute of Technology in Ireland, led by Siobhan Moran, conducted a small-scale genetic analysis on five litters of hoglets brought into rescue centres, one litter from Devon and four from Jersey; in total, five females and 25 hoglets. Their results, published in the Journal of Zoology in 2009, showed evidence of multiple paternity. The Devon litter and one of the Jersey litters each yielded three paternal alleles, representing the mother and two different males. 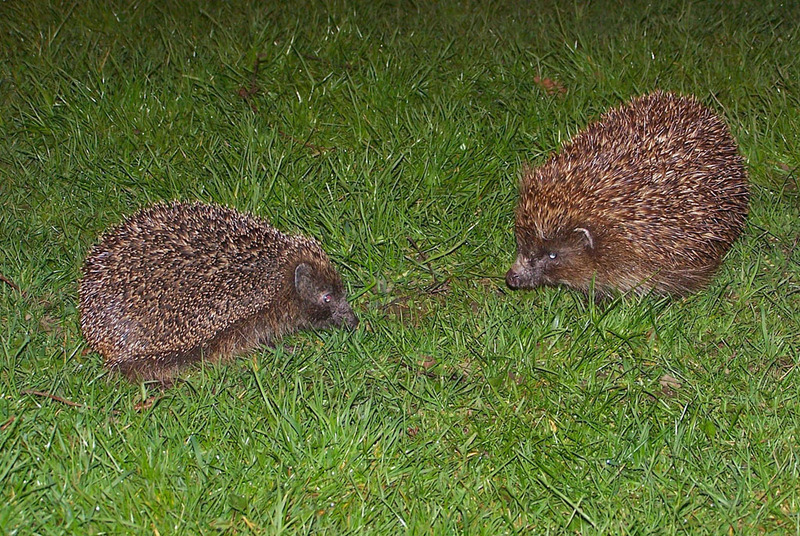 Two adult hedgehogs courting in my garden in Hampshire during July 2013. The male gingerly circles the female, looking for an opening, but is swiftly rejected. He nonetheless persevered and the two walked off together about an hour later. - Credit: Marc Baldwin. Interestingly, Haigh and her co-workers also observed that hedgehogs moved into poorer quality pasture habitat (where food was less abundant) to breed, suggesting that less food in the area may mean fewer distractions from mating – at the end of the breeding season they moved back into neighbouring invertebrate-rich habitats.